Cook's Knife Corian Black - Spyderco, Inc. Page 985 – Spyderco, Inc. The K11 Cook’s Knife is produced exclusively for Spyderco by some of Japan’s most experienced and respected cutlers and represents a new dimension in our kitchen knife line. This uniquely capable “do-all” kitchen tool is large enough for serious cutting chores, yet offers the refined balance, control, and precision normally reserved for smaller paring knives. Its drop-point, PlainEdge™ blade is crafted from VG-10 stainless steel—a workhorse material that offers an excellent balance of edge retention, corrosion resistance, and ease of sharpening. The blade’s full-flat grind supports a gracefully curved edge, creating exceptional edge geometry to ensure low-friction cutting performance. 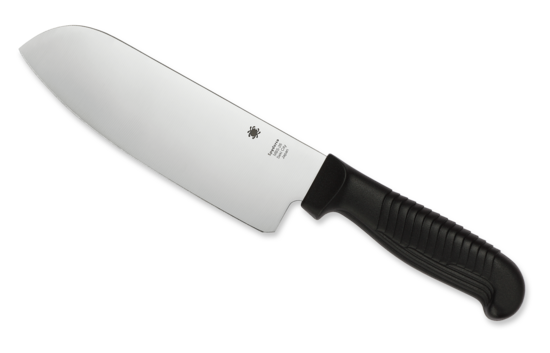 The K11’s handle features a full tang couched between durable, solid Corian® scales. Beautifully contoured for a comfortable, hand-filling grip, the polished scales are permanently attached with three heavy-duty stainless steel cutler’s bolts. In addition to its visual appeal, the elegant styling of this knife also translates into amazing ergonomics and balance that make it one of the most comfortable and easy-handling kitchen knives you’ll ever use.